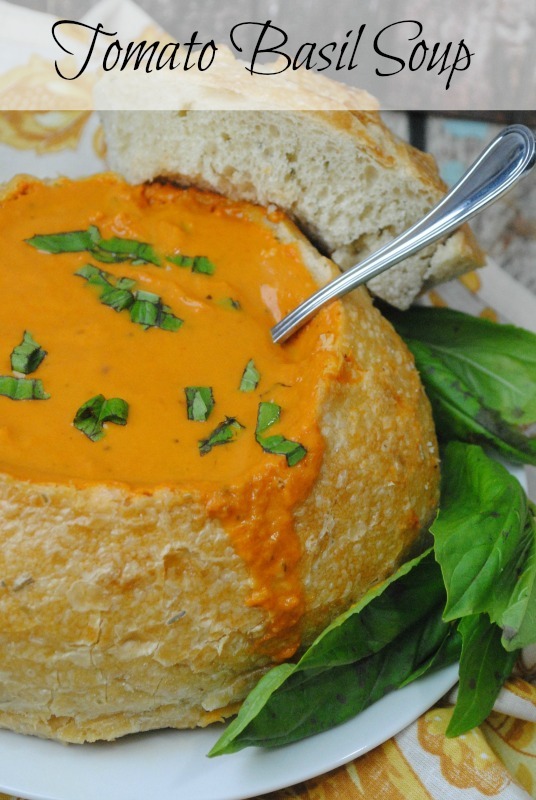 Creamy Tomato Basil Soup in a warm bread bowl is comfort in itself! This cream based soup may have a few more calories than an average broth based fusion, and the bread bowl is certainly not fooling anyone into believing this is a diet food. But let’s be real here, there are days when I have absolutely have no desire for anything low calorie! If we’re honest, I think we all have those days. If it’s a day that I am- shall we say- less than my best, and would prefer to just stay home alternating between eating everything in sight and laying in bed curled up with my heating pad– then this is one of the meals I love having ready to devour! I mean eat. There’s no need to entirely discount this recipe if you’re eating healthy. While it’s not going to take you down a dress size overnight, it’s still a wholesome and let’s not forget delicious soup. Ditch the bread bowl to cut out the majority of the carbs and look at the ingredients. All healthy stuff! Heavy cream is where most people get caught up, but let’s take a second look. Heavy Cream is listed on EatThis.com (Eat This Not That) citing, “Heavy cream is a healthy fat that helps keep your blood sugar stable between meals and snacks, which means consistent energy and brain power.” I don’t know about you, but that definitely sounds like something I need more of! Using a sharp knife, cut a circle into the top of each loaf, leaving a 1-inch border all around. Remove the bread top, then hollow out the middle with a fork or your fingers, leaving a thick bread shell. 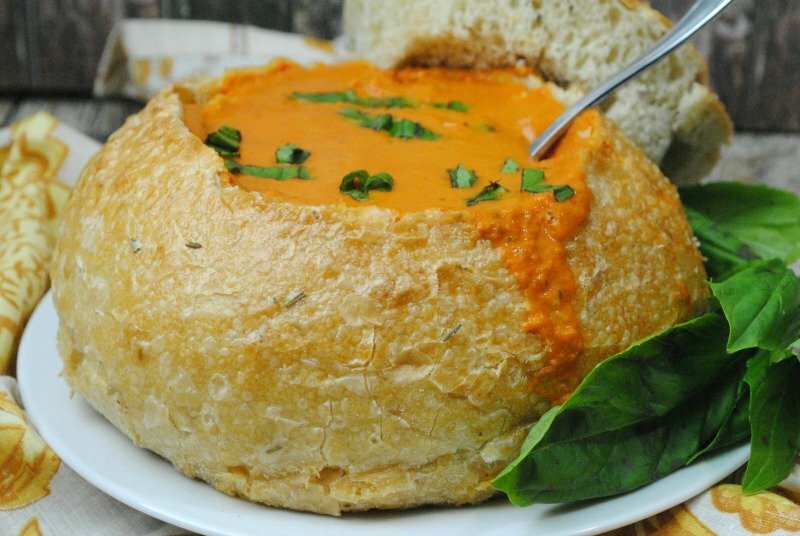 Scoop the soup into each bread bowl and garnish each with remaining basil.